Sunny and 78 degrees in my neck of the woods this morning. I did a killer leg work out and now I am blogging! I found this delectable dessert last night at a local grocery store. Non-dairy and free of all the bad stuff -that means my vegansweetpotato gave it the ole’ thumbs up. Please check out the “About Me” page to figure what I am all about. The journey is slowly getting started! 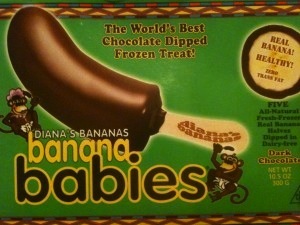 This entry was posted in Banana, Chocolate, Dessert. Bookmark the permalink.